1. Click Home -> Install Agent. 2. Click 'Scan Computers' to add all network computers to the list or click 'Add' to add computers one by one by computer computer IP address. 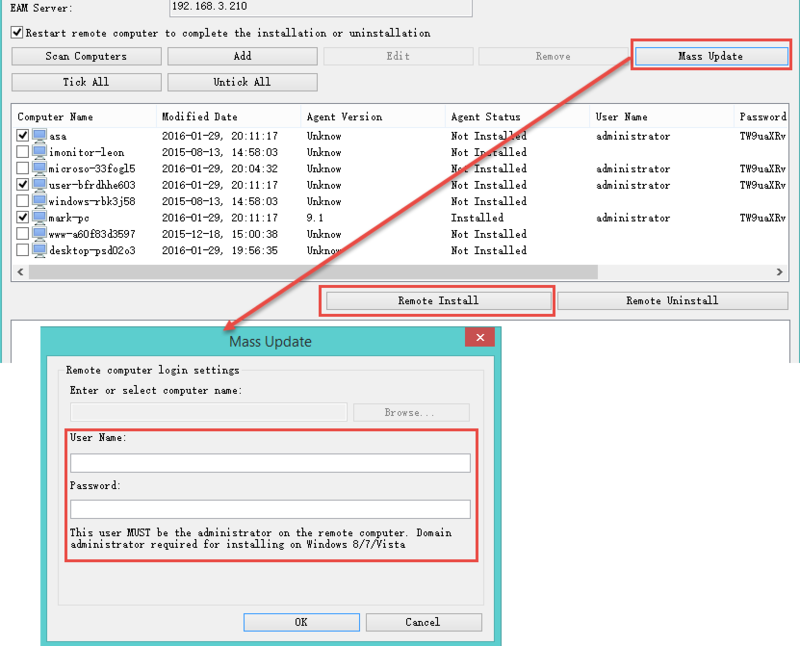 3.Double click destination computers and input remote login Administrator name and password for each of them in the popped up window, if the computers are domain based, you can click 'Mass Update' to set domain administrator name and password for all computers. 4. Tick destination computer(s) in the list. 5. If you want the remote computer to reboot automatically to complete the installation, please tick "Restart remote computer to complete the installation / uninstallation". 7. The program will show you the install progress and result. When remote installation was finished, iMonitor EAM agent program will start after 1 minute, please click Home -> Refresh to refresh agent information. * If there's error message like 'Couldn't connect to remote computer. Firewall blocked the connection or invalid username / passwrod', please disable the antivirus and turn off the Firewall on target computer, then try again. * If remote installation failed, you have to get access to the target computer which you want to monitor and manually install agent program.